The comparison of the three lenses under test bring some interesting distinctions. Note that the D FA* 50mm and DA* 55mm lenses already have their own in-depth reviews. The oldest of the three is the SMC DA* 55mm F1.4. It follows the design language used since the beginning of the DA line until some time after the Hoya-Pentax merger. The golden accents that identify STAR lenses from this era are elegant and distinctive. 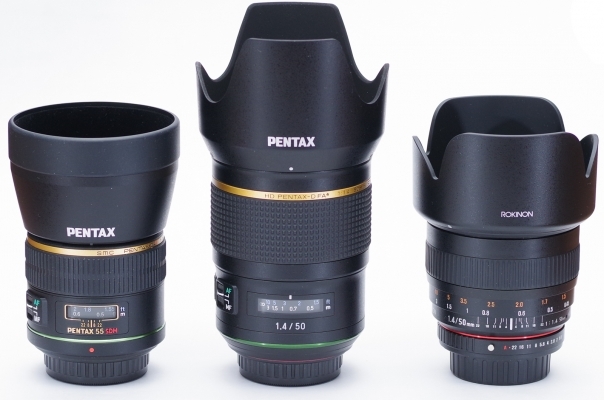 The external body is made of plastic but retains the usual finish of Pentax lenses. The focus ring is wide and ribbed. This being a DA lens, there is no aperture ring. The DA* 55mm is a relatively compact lens. It ships with a conical hood that almost doubles its length when mounted. The 55mm features first-generation SDM, which does not have the best of reputations. In the case of this particular lens, SDM seems to be reliable, as almost no failures have been reported in our forums. 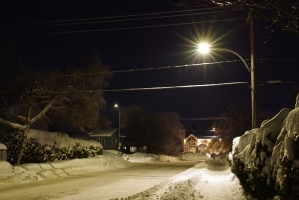 The 55mm is weather resistant, like all STAR lenses. 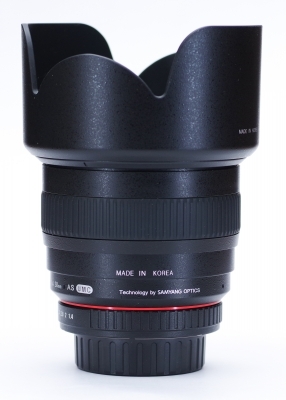 The Rokinon lens is actually a rebrand of a Samyang lens (the lens bears a "Technology by Samyang Optics" label). The only differences between the two brandings are cosmetic. Larger than the DA* 55mm but still fairly compact, the Rokinon 50mm F1.4 is manual focus but, on K-mount at least, it offers both an aperture ring and auto exposure control via the A setting. 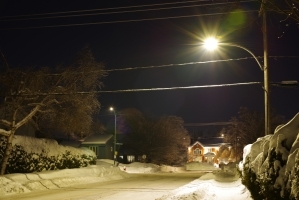 It also communicates its focal length to the camera; there is no need to enter it manually. The lens is mostly made of plastic, with a wide focus ring. The finish closely matches that of Pentax lenses. Markings on the lens are printed and not engraved. A petal-shaped hood is supplied. Despite its retro styling, the Rokinon 50mm has all the staples of a modern lens. One thing to note on the body is the presence of tiny screws in unexpected locations. 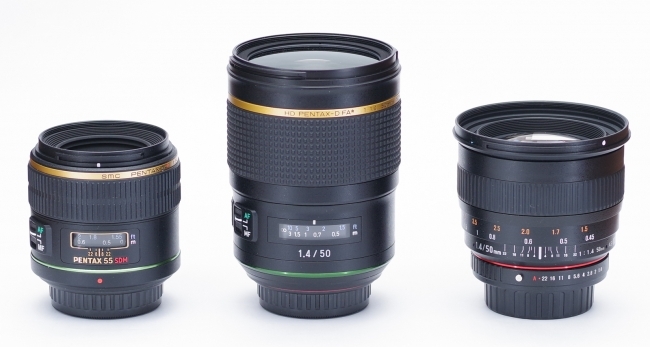 The D FA* 50mm is significantly larger than either the Rokinon 50mm or Pentax 55mm. The design language shows some similarities with the 55: the green and gold rings, the black textured surfaces, the distance window and AF/MF switch are mostly the same. The texture of the focus ring is different, as is the lettering, which follows the minimalist approach used by Pentax since becoming part of Ricoh. The newer lens offers a full metal body, an external AF/MF switch, internal focus via silent SDM, all weather resistance (AW). Just like the 55mm, the D FA* 50mm offers no aperture ring. It also lacks a mechanical aperture control; older cameras will not be able to control its aperture. The DA* 55mm lens is significantly smaller and lighter than the Rokinon 50mm (it is about 25% lighter, as well as shorter and narrower). Both lenses are much smaller than the D FA* 50mm, which is more than double the weight of the 55mm, and almost double the weight of the Rokinon. The D FA* is also almost double the length of the 55mm, while being longer but marginally slimmer than the Rokinon. The front elements show that, even though it's shorter, the Rokinon has a diameter close to that of the D FA*. 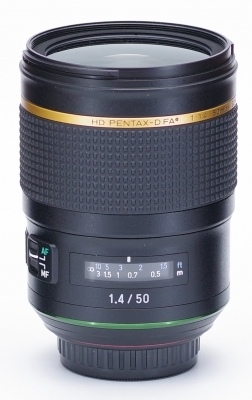 There is no doubt that the D FA* 50mm is huge by Pentax standards. It will be interesting to see if the increase in size and weight is accompanied by a similar increase in optical quality. 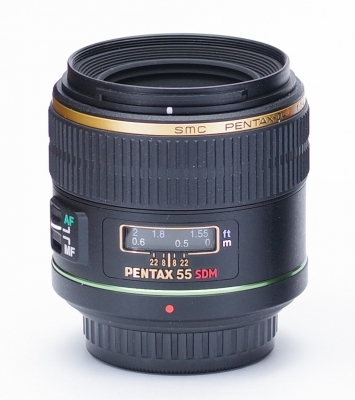 While larger than a pancake lens, the DA* 55mm F1.4 follows Pentax's tradition of small and reliable lenses. Its light weight and compact size makes it easy to handhold. The large hood is light enough to cause no handling limitations. The AF/MF switch is logically positioned on the left side, as with other STAR lenses. There is no aperture ring, which is expected for a DA lens. The Rokinon 50mm also handles well. It is heavier and slightly front-heavy, but never cumbersome. With a manual lens, the position of the focus ring is critical: the Rokinon's is easy to find and operate. The aperture ring also handles well: it has a good amount of friction and the various aperture settings lock clearly. Thanks to its petal shape, the hood appears comparatively smaller than on the 55mm, while actually being larger and wider. It lacks the cutout found on almost all Pentax hoods. Manual focus on the DA* 55mm is possible thanks to the 90° throw on the focus ring. The feedback from the ring is adequate but nothing special; the 55mm is average in this regard, feeling a bit lifeless. The distance scale is easy to read, with pale lettering on a dark background behind a window. There is a timid depth of field scale, however with markings only for F8 and F22, it almost entirely cosmetic. The focus ring comes to soft stops at both ends, as is the case with almost all SDM and DC focusing lenses. Focusing is internal; the lens retains its shape regardless of the focus distance. The focus ring does not rotate when AF is engaged, and the lens offers quick-shift manual override. The Rokinon is a manual lens. Luckily the designers did not cut corners in helping the user lock focus. The focus ring's throw is long enough, at approximately 160°, to reach a good level of accuracy. The whole lens barrel rotates when focusing, and markings are numerous enough. The DOF scale can actually be useful. It has markings for all full stops between F4 and F22 (F5.6 is not labeled but still present). Focusing is also internal. The D FA* lens offers everything one could wish for regarding manual focus. The focus ring is very wide, nicely textured (closer to the M lens than to the FA). It has a nice 125° throw. The ring's dampening is excellent and it will not move by accident. Nor does the ring rotate when AF is engaged; only the distance scale moves. The focus ring comes at soft stops at both ends, meaning that once the ring reaches an extreme of its range, it continues to rotate with increased friction. The D FA* also offers quick-shift, for manual AF override at any time. Finally, the lens features an AF/MF switch. Focusing is internal as with the other two lenses tested. There is of course no autofocus on the Rokinon 50mm. On the DA*, autofocus feels sluggish at all times. AF is near-silent, thanks to SDM. 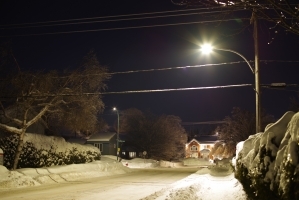 The lens does not tend to hunt, however, even using live view, and despite its perceived slowness, it is accurate. The D FA* 50mm is in another category. Its SDM system feels extremely responsive and dependable. The lens feels among the fastest we have ever tested, and this observation holds both using the viewfinder and live view. It moves to the focus point with a speed and accuracy that's impressive. Its AF system is virtually silent. 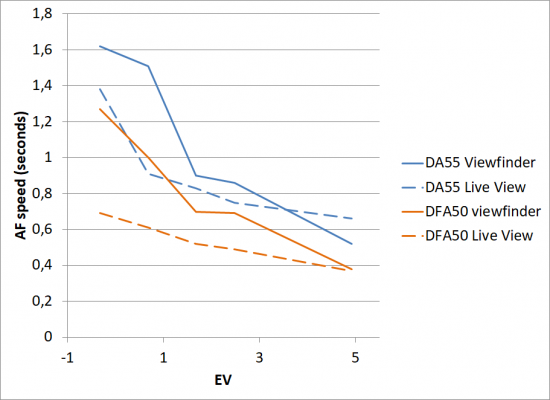 The following chart presents the AF speed of both the DA* and D FA* lenses, using phase detection (viewfinder) and contrast detection (live view) in varying light levels. The DA* 55mm does quite well in our AF test. We have seen many lenses with slower AF speeds in low to medium conditions. What hinders it is probably that, even in good light, AF speed never reaches very high speeds. The DA* 55mm produces almost no starbursts at F2.8, and rather messy rays at F8. This is not one of the lens' strong suits. On the other hand, the Rokinon is able to produce beautiful starbursts, more subdued at F2.8, but well shaped at F8. This is a nice result. The D FA* 50mm stands somewhere in-between: there is little to see at F2.8, but a decent startburst, made of many rays, appears at F8. 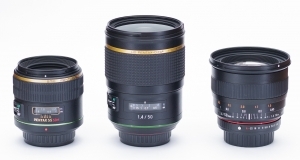 Each of the three tested lenses has its own perks and limitations. The DA* 55mm is more compact, handles well and has a premium appearance despite its mostly plastic body. It focuses with good but not outstanding speeds. The Rokinon is larger, not much heavier, and handles equally well. 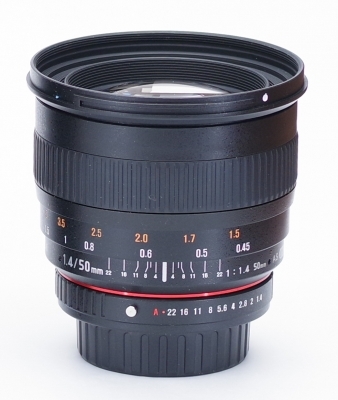 Its focus ring is a pleasure to use, something desirable on a manual focus lens. It produces beautiful starbursts. The D FA* 50mm is by far the largest and heaviest of the three. Its AF speed is outstanding, its handling is also excellent despite the much larger size, but the weight can be a hindrance.